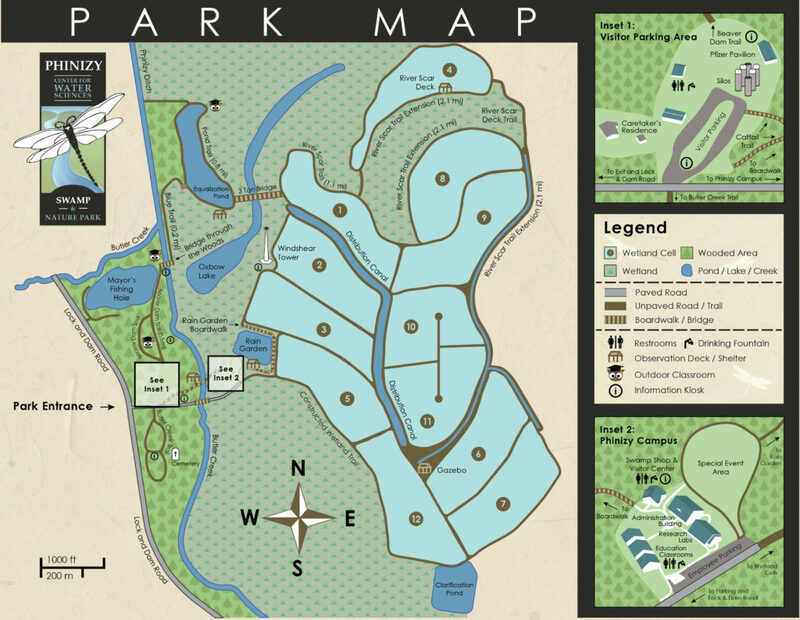 Park maps are available for those who need them. Print one out or pick one up when you arrive! More great overview/details about the facilities. Also, if you’re interested in renting any part of Phinizy check out the Rentals page for more info! Beaver Dam Trail – The trail head starts just beyond the silos & picnic pavilion. Leading Nature Park visitors along a wide trail overlooking the floodplain of Butler Creek, this trail is approximately 0.5 miles long. The floodplain area is filled with a rich diversity of plant life such as Bald Cypress, Water Oak, Sweetgum and so much more. A variety of animal life has also been spotted to include River Otter, Beavers, Red Shouldered Hawk, Egrets & Herons. Bridge Through the Woods –This steel and wooden bridge is 25 feet in length. It spans Butler Creek and provides occasional views of turtle and river otters. It is also a great location for seeing dragonflies, damselflies and sometimes the rare Mayfly, and a great spot for to enjoy listening to songbirds. Nature Park visitors will also notice the deck where many of our Environmental Education field trips and water monitoring programs are hosted. Floodplain Boardwalk and Observation Deck – This is a .1 mile wooden boardwalk with a covered observation deck at the end. This boardwalk and deck are a wonderful introduction to the beauty of Phinizy Swamp Nature Park. Overlooking the floodplain of Butler Creek, the boardwalk and deck provide an excellent spot to see many types of birds, including wading birds (such as the Great Egret), woodpeckers, blackbirds, warblers, and hawks. Also look for the trails through the marsh plants made by beaver, river otter and muskrat. Mayor’s Fishin’ Hole – This popular public pond is maintained by Augusta-Richmond County. An active Georgia state fishing permit is required. In addition to this you can only catch 8 fish per day, no boats or firearms are allowed, and fishing is only permitted during daylight hours. No fishing allowed from the Phinizy Swamp Nature Park side of the pond. Pfizer Pavilion –The picnic pavilion is a covered area that can be enjoyed by all Nature Park visitors. The structure has electricity, sufficient picnic tables to seat 60 to 70 people, a small charcoal grill, and bathrooms are located nearby. The picnic pavilion may be reserved for private picnics and functions. For more information, see the Park Rentals page. Our thanks to Pfizer for providing funds to construct the pavilion. Pond Trail – This dirt trail is 0.8 miles in length. Pond Trail is for hiking and bicycling. This sunny loop takes the visitor around the Equalization Pond that holds treated wastewater before it enters the constructed wetlands. The trail is on a raised berm around the pond, allowing a higher view of the surrounding swamp as well as the pine and deciduous forest. This a great place for viewing a multitude of waterfowl and wading birds such as Mallards, Teal Winged Ducks, Wood Ducks and Ibis. Nature Park visitors may see the occasional swimming alligator, view Grebes and Cormorants, and can be escorted by myriads of flying dragonflies in the summer. Rain Garden Deck & Boardwalk – The wooden deck overlooking the Phinizy Swamp Rain Garden is a living laboratory for students to safely explore swamp ecology. Nature Park visitors can view a variety of wildlife such as turtles and waterfowl in the Pond. Looking beyond the Pond, Nature Park visitors and bird enthusiasts will often sight the spectacular Osprey, Red Shouldered Hawk and other birds of prey. As visitors make their way along the 0.1 mile Rain Garden boardwalk, look for signs of beaver activity! No fishing allowed. Wetland Cells – In 1993 the City of Augusta was ordered to upgrade its wastewater treatment system. Many options were considered, but a proposal to use man-made wetlands as a tertiary (third) step in the treatment process was ultimately chosen as the solution. Treated wastewater that was once piped into Butler Creek is now sent through the constructed wetlands system consisting of the distribution canal, 12 x 30 acre wet cells (or ponds), before being released back into the Savannah River. The Phinizy Center Wetlands system is an extraordinary example of science & nature working in unison. As the treated water makes its journey through these cells Nature Park visitors can experience the wonderful ecosystem that has been created. With approximately 14 acres of trails, this is the perfect place to bring your family for a bicycle ride or walk & view the variety of wildlife that lives here. No fishing allowed. Windshear Tower – Located by Wet Cell 2, the Windshear Tower is used by the airport to measure average surface wind speed & direction using a network of remote sensors. The tower situated on our Nature Park has become home to regularly nesting Osprey. An Osprey chick requires two pounds of fish per day! That’s why the wind shear tower is an ideal nesting place as it is the highest spot in the Nature Park and has a large supply of fish in the surrounding wetlands. The nest is about 5 feet wide and is called an Eyrie. Osprey build it up with sticks to make a huge bowl. Bring your binoculars to make the most of your viewing experience!